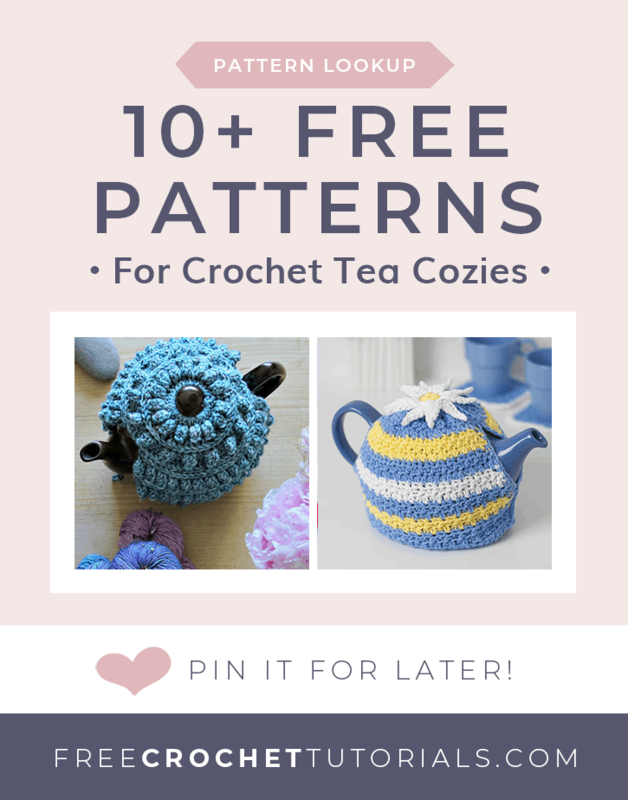 This post includes a wide range of free crochet tea cozy pattern options, for different sizes of tea pots. Beginner friendly pattern options have been included, as well as, patterns with video tutorials. You can even take a very basic tea cosy pattern and then embellish it in a unique way to create your own original piece. I’ve seen a number of stunning and unique finished tea cosies on Pinterest for Fairy Houses, Gnome Homes and Gardens. These unique designs are often done without patterns so be sure to consider options like adding embellishments to make your own original piece! Make this very pretty and feminine tea cozy with a 4.5 mm hook and DK / light weight yarn . This easy-to-crochet tea cozy is made with medium weight cotton yarn and a 4.25 mm hook. This tea cozy pattern uses DK weight yarn / light weight yarn  and a 4 mm (G) and 5 mm (H) crochet hook. This lovely textured Tea Cosy can be crocheted in any tweed/flecked aran/worsted weight yarn . 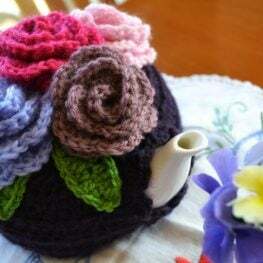 This post includes instructions to make a tea cosy to fit your tea pot! The tea cozy pictured was crocheted with 8 ply yarn and a 4 mm (G). 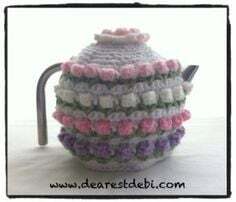 Great for beginners, this Crochet Teapot Cozy pattern includes a video tutorial. 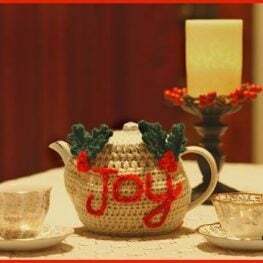 The Joyful Teapot Cozy is the perfect choice for the winter holidays. 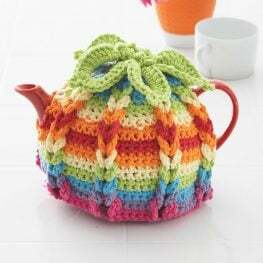 This pretty 4-cup tea pot cozy is available as a free pattern from Yarnspirations and a supportive video tutorial is available from The Crochet Crowd. This adorable pattern is available as a video tutorial on YouTube from Jayda InStitches. 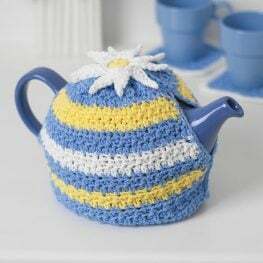 This pattern is written in UK Crochet terms and for a 2-cup teapot. With DK Weight Yarn and a 4 mm (G) hook you can make this pretty teacosy. The pattern is a free downloadable PDF from Emma Varnam. 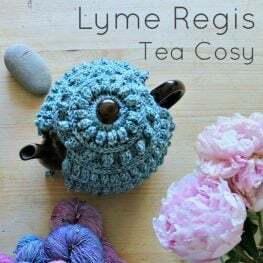 Make this reversible crocheted tea cozy with 4-ply yarn and a 4 mm (G) hook. Instructions are included for a large pot and a small pot. If you scroll to the end of the instructions a separate section includes American Instructions. 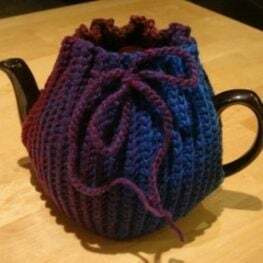 This tea cosy is genius! The instructions are for a tea cosy that fits a 6-cup tea pot. 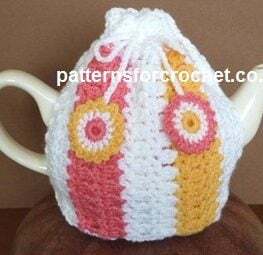 Another beautiful tea cosy pattern to fit a 6-cup tea pot. This vintage style cosy is created with flower granny squares. This unique ripple tea cozy is crocheted with DK / light weight yarn  and a 4 mm (G) hook. Two pattern sizes are included, one for a 4-cup cozy and one for a 6-cup cozy. With the vintage appeal of the granny stitch, this tea cozy uses 8-ply wool and 4 mm (G) hook.